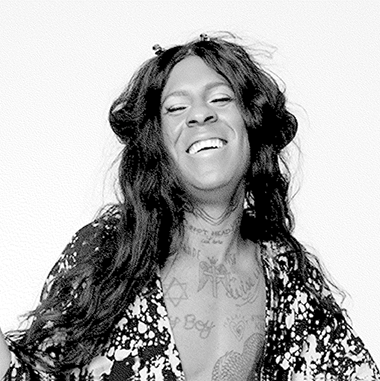 Mykki Blanco (born Michael David Quattlebaum Jr in 1986, USA) is a writer, activist and international performing artist. Quattlebaum first began making crushing industrial punk under the moniker No Fear before beginning a video art project that would grow to be the riot grrrl rap of Mykki Blanco. In 2012, Mykki burst into the music scene with the Mykki Blanco and the Mutant Angels EP. In the following year, she released his second work Betty Rubble: The Initiation EP, and in 2015 Mykki partnered with !K7 to create her own imprint DOGFOOD Music Group, a label that aims to give voice to underground artists that share her vision and “transcend conventional cultural boundaries / constructs.” Blanco's debut album, Mykki, was released on 2016.